We honor all who served on Veterans Day, November 11th, 2012. Supplier Excellence Alliance (SEA), has announced California Metal & Supply as a finalist for the prestigious Aerospace & Defense Industry Supply Chain Awards for 2012. Winners will be announced at the 6th Annual Awards Event during the first quarter of 2013. California Metal & Supply has been selected as a finalist in the Stephen E. Barton Leadership and Culture category. This supplier award recognizes companies for their commitment to development of excellence in leadership processes. Suppliers were nominated in recognition of their performance and investment in continuous improvement. "Suppliers who participate as finalists in this national program not only gain much-deserved recognition for their improvement efforts, but also serve as an inspiration for other aerospace suppliers throughout the year," said Michael G. Beason, SEA Chairman. SEA is an aerospace & defense non-profit alliance founded in 2003 by prime and tier-one companies and led by sub-tier suppliers committed to accelerating supply chain performance. SEA customers benefit from increased performance and supply chain transparency. SEA provides a lean management system and a voluntary supplier certification program for enhanced visibility, performance, and collaboration. SEA is funded by supplier memberships and sponsorships. .
We are a minority owned small business based in Santa Fe Springs, California that specializes in supplying aerospace metal products to customers big and small. We strive to become a qualified and valued diversity supplier in the industry but we also believe in giving back to the communities we serve. View our small business story here and vote! We are asking all our friends, customers and associates to vote so that we can be chosen from the top 100 companies in the contest to win a Small Business Grant from FedEx. The Small Business Grant from FedEx will let us share our small business’ story with the rest of the world to compete in grants from FedEx. We feel our unique business story separates us from the rest and winning the contest could make a big difference for our small business. California Metal & Supply has just released a new updated Line Card! 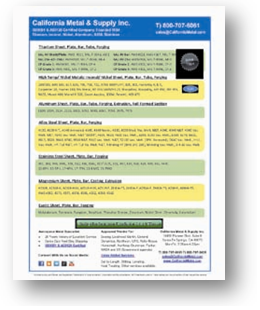 Take a look at our hard to find specialty metal products and value added services on our newly updated Line Card. Our customers tell us that the California Metal & Supply Line Card is a valuable resource and they always keep us in mind for their hard to find items. Keep the California Metal & Supply Line Card handy as a quick reference for your hard to find specialty metal products. 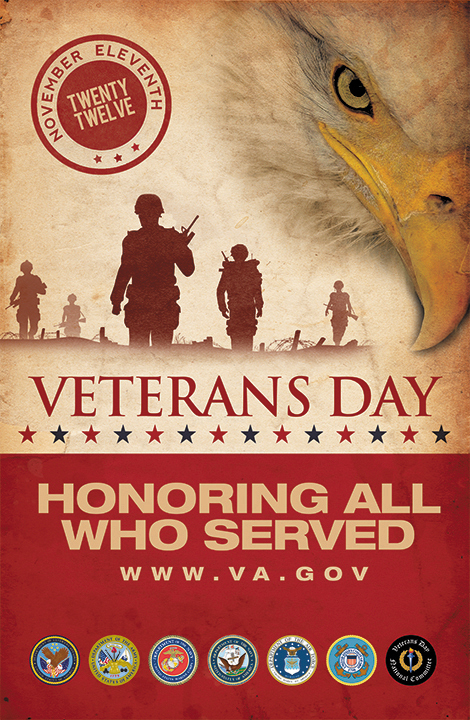 Download the Line Card today! Free gift with first purchase order! A company like California Metal & Supply Inc. is as hard to find as are the metals the company distributes. Located in Los Angeles a short drive from the international airport, California Metal & Supply is one of the leading metal distributors in North America with a customer base mostly in the aerospace, automotive, petrochemical and defense industries, as well a growing international customer base. While the task of sourcing and supplying precious metals such as Titanium, Inconel, Nickel, Aluminum, Stainless, 13-8, 15-5, 17-4, 17-7, Kovar, and Invar is a primary focus, California Metal & Supply also believes in responsible business management. With the help of its valued customers, the company supports a number of local and national charities, essentially giving back to the communities that have helped its success since 1984. In addition to the company’s philanthropic actions, outstanding customer service is a defining goal of business undertakings at California Metal & Supply. Through a combination of both traditional and progressive methods of communication and marketing, California Metal & Supply strives to reach its broad base of customers in a way that works for them. Paper mail, social networking sites and an informative website with a “click to call” facility ensure that customers from all stages of industry have easy access to information concerning inventory, supplies and manufacturing. California Metal and Supply extends this practice of open communication with its international client base too, offering packing and handling services, metric conversions and full documentation of product specifications of its plates, bars, and tubing products. With the capability to supply hard-to-find precious metals for important industries such as Defense and Aerospace, why not aim high? California Metal & Supply is doing just that. This reputable company has set big goals for the future – intending to add experienced staff to the existing team and double its sales over the next year. Combining old-school business ethics and the principle of giving back with the desire to lead the way in the precious metals field provides a solid base from which to succeed. The company’s unmatched range of specialty metals, superior process and fabrication facilities and a proven commitment to its customers will surely stand it in good stead. Watch this space as California Metal & Supply continues to expand its influential reach both locally and globally. Not only did Disneyland Resort guests get a special treat on Friday when the space shuttle Endeavour flew over, we here at California Metal & Supply were just as excited when it flew over our office in Santa Fe Springs. All eyes were on the orbiter, atop its 747 Shuttle Carrier Aircraft (SCA), the main attraction up in the sky. 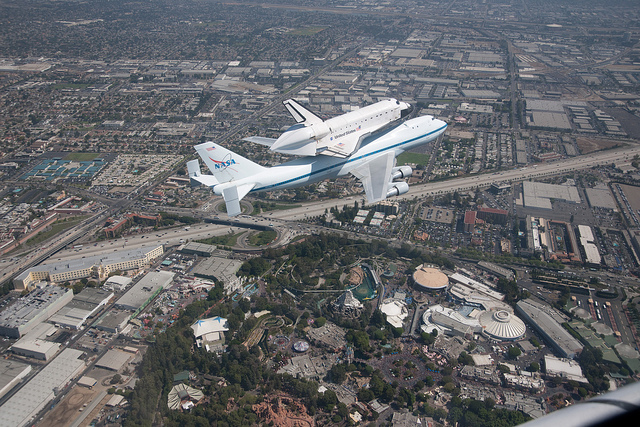 Friday flyovers of Endeavour included regional landmarks such as its future home at the California Science Center and Disneyland, among others. Finally, Endeavour landed at Los Angeles International Airport (LAX). The orbiter will be transported to the California Science Center next month. We here at California Metal & Supply share in the excitement of this momentous occasion being a proud Boeing Award Winning Supplier and metal supplier for NASA.